The Bolivian factory signed an agreement with the Italian company and from the next year will bring limited collections of high quality for the entire region. Starting on 2016, the Bolivian Ceramics Factory (Faboce) will produce industrial gold ceramic for the famous Italian brand Tonino Lamborghini Tiles and Styles dedicated to the manufacture of luxury liners. “Extremely exclusive inputs are used. Some products even carry industrial gold. So the quality of the input cost is much higher (…) and are destined for a premium sector. There will be limited collections and are not going to be repeated in time,” said Faboce’s general manager, Tito Orellana. The Italian brand invited Faboce to the fair of Versailles, the most important in the world of ceramics and porcelain and signed an agreement. Lamborghini, after evaluating several Latin American industries, selected the Bolivian factory to be their partner so that it can produce coatings of high quality and export for the whole region. “From 2016, Faboce will produce in Bolivia, the Tonino Lamborghini brand for marketing in Bolivia and the rest of South America, especially six countries such as Argentina, Chile, Peru, Paraguay, Venezuela and Uruguay,” explained the Bolivian executive . A group of Bolivian professionals traveled to Italy to be trained by the European giant for a month and a half. Lamborghini technicians will then arrive in the country for the development of one of the four plants Faboce has. The new products will be developed in the new plant which was opened in September last year in the municipality of Cotoca, Santa Cruz, with an investment of $20 million dollars. This factory was designed in a modular way. Has spaces for milling, mass preparation, printing and a furnace that can produce 150 thousand square meters of tiles per month. “But if a second oven can be placed, automatically will double production,” said Orellana. This plant also is the only one in the country that has the capacity to produce tecnogranito. That is, an industrial marble, inexpensive and it can support a lifetime of more than 100 years. The company plans to develop, at first, 15 new products under the brand Tonino Lamborghini and exclusive designs, unique materials, limited collections and led to higher market segments and with the intention of reaching the most important markets in the region with quality products. Currently, Faboce exports to Peru, Chile and Paraguay. However, Orellana clarified that “volume is quite limited by the lack of competitiveness of the exchange rate”. He explained that the dollar in the neighboring countries is fairly valued, while ours was frozen regarding the Bolivian currency. “While Brazil and all neighboring countries devalued their currencies by 30% to 40%, in ours remained. That makes our product to not be competitive abroad,” he said. All Lamborghini family will arrive in the country to launch in Latin America, which is expected to be held next year. This firm point topped the European high-end, set his sights on the region to expand their production and global brand in the coming months. With the “Days Faboce” a promotional price reduction, the company managed to sell around one million square meters of various coatings such as ceramics, porcelain and tecnogranito, Faboce’s general manager, Tito Orellana said. “It was a success, so much so that the promotion was extended twice by request. Each communicated that they were the last days the crowd gathered. More than one million square meters between ceramics, porcelain and tecogranito were placed”, precised. With the promotion there were extensive discounts. For example, the porcelain was offered up to Bs35 per square meter when its value is doubled. The same happened with the tecnogranito that being a new product, started to enter the market. 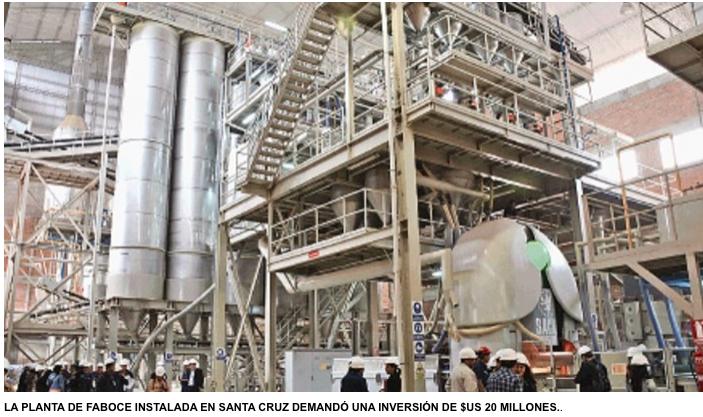 “The plant (in Santa Cruz) is reaching a production of 120 thousand square meters between tecnogranito and porcelain per month,” he added. Currently, Paraguay, Uruguay, Chile and Peru expressed their interest in acquiring the new product but are still in negotiations for the price of marketing. Ricardo Auzza, board member of Auzza Group, owner of Faboce said on a previous occasion that the tecnogranito is a variety of natural marble. “This is a homogeneous product. Has been processed at 5,000 tons of force and burned at 1,200 degrees of temperature, to get a high quality product,” he said. I feel happy and proud when ventures like this materialize for Bolivia. I welcome Faboce to The Hall Of Bolivian Fame! This entry was posted in Bolivia, Business, Economics, Santa Cruz and tagged competitiveness, construction, national industry. Bookmark the permalink.